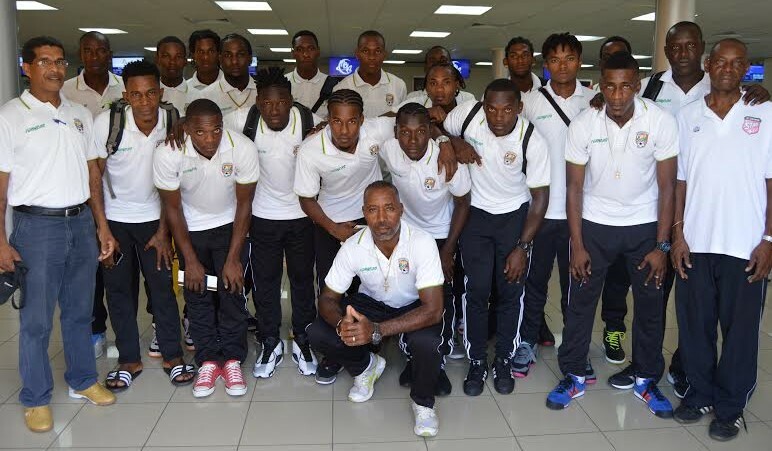 Grenada’s SpiceBoyz arrived in St Lucia last Saturday to participate in the Windward Islands Football Association Men’s Tournament. Captained by midfielder, Jake Rennie, the rest of the team comprises of: Shane Rennie – Midfield, Shanon Phillip – Defense, Irvine Smith-Defense, Leaon St. John – Defense, Kitson Bain –Forward, Cassim Langaigne – Defense, Jason Belfon – Goalkeeper, Josh Charles – Goalkeeper, Wendell Rennie – Midfield, Jalon Young-Defense, Jamal Charles-Forward, Kareem Coutain Midfield, Raymond Alleyne – Defense, Clive Murray – Forward, Aswad Phillips – Midfield, Rohan George – Defense, and Romar Frank – Midfield. As the countdown continues for the World Cup Qualifier round the technical staff of the team is using this tournament to further gauge their players’ capabilities. The entire technical staff has accompanied the team excluding the Team’s Coach, Jorge Anon, who had to return to his home country to address some urgent matters. In his place the team is been led by Lester Smith, Peter James-Manager, Augustine Jones – Equip Manager, Jerry Alexis Trainer, Anthony Modeste – Assist Coach, Andrew Munro – Assist Coach, and Thomas Alexis – Goalkeeper Coach. St Vincent and the Grenadines defeated The Grenada SpiceBoyz 3–2 in the opening match yesterday, Tuesday. The next match will be against Dominica at 5:30 pm on Thursday, and St Lucia at 7:30 pm on Saturday. The SpiceBoyz are expected to return to Grenada on 17 May.